Our Acolytes serve in the Procession, the Gospel Sequence and the Exiting Procession. 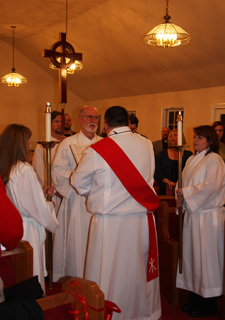 Our Acolyte Master trains each person in the procession as to the responsibilities of that position. Serving as an Acolyte is a great opportunity for our youth to begin to serve at our weekly Eucharistic services. Anyone interested in serving as an Acolyte can see Father Justin for more information. Our Altar Guild assists the clergy in the preparation and cleaning of the Altar, the Altar Linens and the metalware. Our Guild takes their responsibilities very seriously in preparing the table of the Lord for Eucharistic Services. If you are interested in becoming a part of the Altar Guild, please see Father Justin. Our Lectors participate in Eucharistic Services during the Liturgy of the Word, or the reading of the Lectionary scriptures for the week. We follow the Book of Common Prayer 1979 edition as the approved Lectionary for the Charismatic Episcopal Church. Our Lectors serve on a rotating basis, and if you are interested in participating, please see Fr. Justin.